Musical instruments new and used are found in a powerful inventory of quality brands at Mooresville Jewelry & Loan’s musical instrument section. Mooresville Jewlery & Loan owners have operated a music store in the Mooresville area since the 1980’s. MJ&L is a serious music store for professionals, students, teachers, school band departments and casual players. Find every musical instrument and accessory imaginable. Come see the MJ&L Wall of Guitars and the Drum Center. 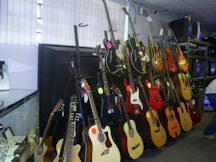 Mooresville Jewelry and Loan is a direct dealers for the hottest brands in guitars, basses and amps. We have brass and reed instruments, drums, keyboards, PA systems, violins, guitars, and more!